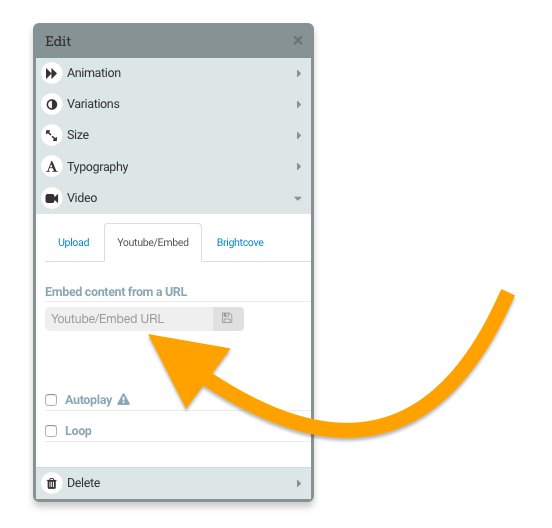 You can embed videos from services such as Youtube by adding an embed code to the field that says ‘OR embed content from a URL’ in the ‘Video’ menu. 💡 Pro Tip! If you are using a YouTube video you can prevent suggested videos from showing at the end of the video by adding ?rel=0 to the end of your embed link. Content will need to be on an SSL protected server if you use the iFrame for embedding. We do not support embedding of 360 videos. Click here if you would like to see more details.